• Asymmetry. One-half the mole is different from the other half. • Border. The edges are poorly defined, irregular, or scalloped. • Color. The color varies from one area to another. It might be white, red, or blue. Or it might have shades of tan, brown, or black. • Diameter. When first diagnosed, melanoma is often larger than the size of a pencil eraser. • Evolving. Moles or skin lesions often look different from other moles. Or they may be changing in size, shape, or color. 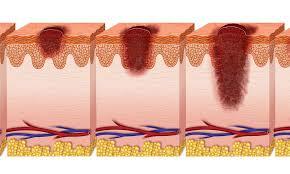 Skin cancer may show up in other ways too: You might have a slowly growing thick patch of skin that looks like a scar. You might have spots that are bleeding, painful, or itchy. Or you might have a band of dark skin around a toenail or fingernail or a dark streak under a nail. Do you find it hard to keep track of skin changes like these? Try using the Body Mole Map available at the website of the American Academy of Dermatology. Examine your skin. Look for warning signs of melanoma. The point is to check all areas of your body. So you don’t miss any areas, try to check in the same order each time. Look in a mirror and check your front, back, and sides. Check forearms, underarms, palms, legs, and feet. Don’t miss the soles and spaces between your toes. Use a hand mirror to check areas you can’t otherwise see, like your scalp, the back of your neck, and your buttocks. Better yet? Have your spouse or partner get trained in spotting skin cancer. A recent study showed how effective this can be. This approach could be even more important for those at highest risk. That includes people with many moles or a previous history or family history of melanoma. See your doctor. If you have any of signs of melanoma or other skin cancer, do not wait. See a dermatologist right away. This special skin doctor is best trained in diagnosing skin cancer. Remember: At some point in their lives, one in five Americans will develop skin cancer. Seem like the odds are stacked against you? Not necessarily. If you catch it early, skin cancer—even melanoma—is very treatable.